Frank Upfold came to Betchworth in 1903 when his father, Harry Upfold, took up his post as a local police constable. The family had come from Shottermill, near Haslemere, where Frank was born on September 1st 1897. Frank was the eldest child of Harry and his second wife Clara Kate, but he had five older half-brothers; only three of them, Harry, Ernest and Sydney, were still living at home. The family lived at 2, Coombe Cottages and the children all attended Betchworth School. Frank started in September 1903 and left in 1911 to enter the world of work. He attended Sunday School and won a first class prize for attendance which was presented to him by Mrs Du Buisson in January 1910. Frank was also a Scout, a fact later referred to in the Parish magazine. By the time Frank left school, Harry and Clara’s family had grown and there were now five younger sisters and a brother. Harry had also retired from the constabulary and had taken up the post of caretaker at Betchworth school. In the following June, the magazine recorded that Frank had been posted missing since April 1918. But Frank was already dead. He had died on March 26th 1918, aged 20, at Assevillers which is about 6 miles from the Somme. Assevillers was evacuated by the 5th Army on the same day that Frank died and was not retaken until August 1918. 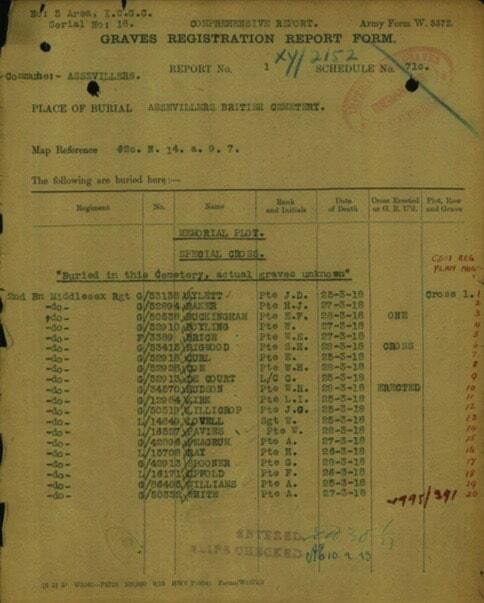 The Graves Registration Report Form for Assevillers British Cemetery which has details of some of the 2nd Battalion Middlesex men who all died at the same time as Frank Upfold and whose graves are unknown. ‘Buried in this cemetery, actual graves unknown’. It is dated 1923. As a result, Frank Upfold’s exact place of burial within the cemetery was unknown so his name was placed on a special memorial which recorded the names of those whose graves could not be identified. Frank Upfold’s name is also on the Haslemere war memorial.